It isn’t exactly hard to speculate that we women have evolved faster than men. The best example in the defence of this argument is- Look at our clothes! While men’s clothing can be ticked off on the fingers of our hands, one could run out of a family of fingers considering the options for women! In a modern day context one of the most worn attires is the top or blouse over jeans, trousers or any other sort of lowers. If we look at history the closest we come to tops in history is the choli. The choli is a short fitted jacket kind of structure used to cover the torso. It is traditionally worn with sarees, ghaghras, lehengas or half sarees. Designers today have rediscovered the potential of the humble choli and reinvented it to give it a more modern, top-like look. These ethnic wears, embellished in zari, hand embroidery work or encrusted with stones can be teamed with any kind of lowers and gives you a distinct sophisticated appearance. Also contrasting cholis with sarees and lehengas are the latest trend and truly elevate your style quotient. One of the latest trends for monsoon festivities is modern cholis and tops. We, at Craftsvilla, offer a range of cholis and tops perfectly suited for the monsoon weddings, birthdays or any other celebrations. Tops are a girl’s best friend literally. They are versatile and can be teamed up with almost anything, be it casual wear or formal wear and you are good to go! 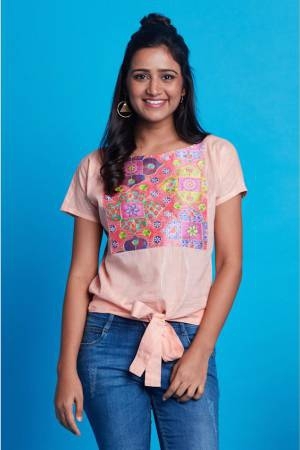 At Craftsvilla find a range of tops varying in lengths, from sleeveless, half sleeved to full sleeved tops. We offer a variety of colours in different sizes from leading designer labels. Be it formal shirts, polos, casual tees or tanks, we have it all. We are the one stop top shop!